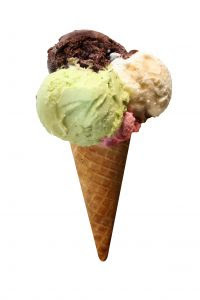 He enjoyed three or four scoops of ice cream a day — his favorite was said to have been Jamoca Almond Fudge — and he made it his company policy that employees were allowed to eat all the ice cream they wanted. No American hasn’t been touched by his creations and the joy he brought to life. Mr. Irvine Robbins, the co-founder of Baskin Robbins, died of old age today at the age of 90. As a young boy, his father owned a dairy and he had a job working in his father’s ice cream store. He noticed that people got a smile on their face when they bought an ice cream cone. During World War II, while serving as a lieutenant in the U.S. Navy, he made ice cream for his fellow troops and after his discharge, he put his life savings into his first store. He eventually joined forces with his brother-in-law, Burton Baskin and the rest is history. He was known to start the day with a bowl of cereal topped with a scoop of banana ice cream and even his swimming pool was shaped like an ice cream cone. His 31 creations, which actually numbered more than 1,000 flavors over the years, commemorate memorable moments in our American history — Lunar Cheesecake for the 1969 moon landing... Beatle Nut for the 1964 appearance of the Beatles on Ed Sullivan... Baseball Nut to commemorate the 1958 Dodgers' move to Los Angeles... the 31st flavor was mint chocolate chip. There was a flavor for every day... and a smile for every day, too. Enjoy all of the sweetness in life to the fullest is a message that’s never been more important than it is now. I dedicate my nightly bowl of ice cream to Mr. Robbins, although tonight it is with a tear in my eye.